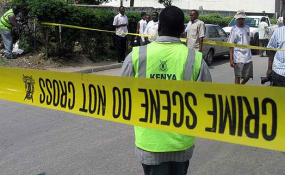 A Form One student in Kericho County has gone missing after allegations that he killed his widowed mother's lover at their home in Bureti. Neighbour Irene Langat claimed the boy broke into the house on Monday night and repeatedly stabbed the man in the chest using a sword. He allegedly committed the crime after finding the two in the house in Ririat village, Cheborgei location. Family members said the boy was likely irked by the man's night visits, his father having died a few years ago. The man, 65, fell and died outside the house while trying to flee. Neighbours who rushed to the scene after hearing a commotion found him in a pool of blood. He died shortly after. Area Chief Anderson Rotich said the boy went missing immediately after committing the crime at around 10pm. Mr Rotich said the woman record a statement with police, who launched a search for the student. The body was taken to Kapkatet Sub-county Referral Hospital mortuary.